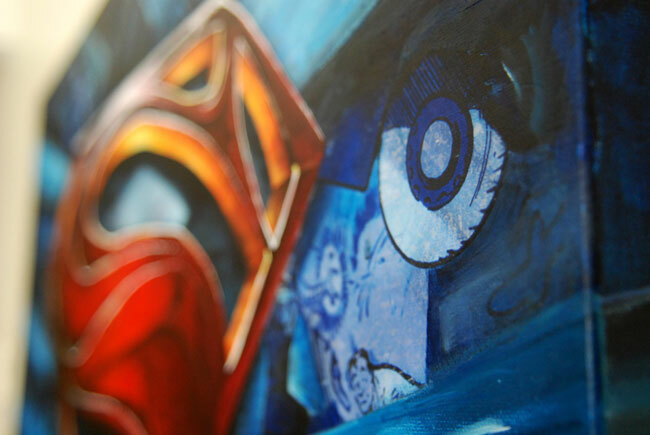 A mixed media painting for a friend of mine who’s a huge Superman fan. 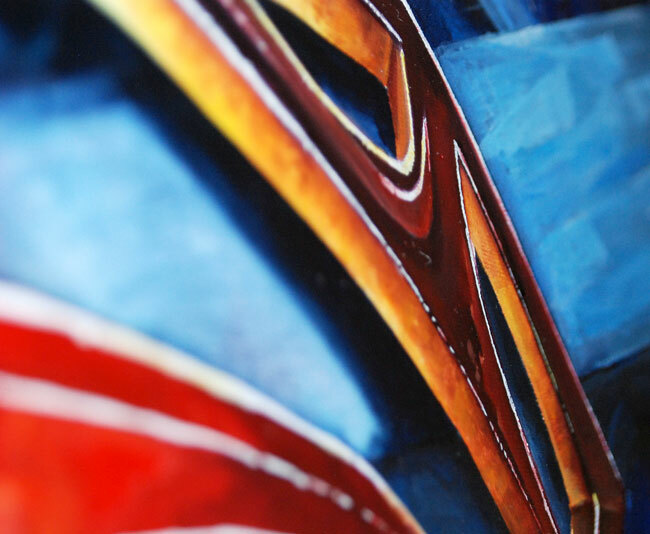 He requested a painting of a Superman logo, but I needed to add more; something to add depth and also hold the viewer’s attention. 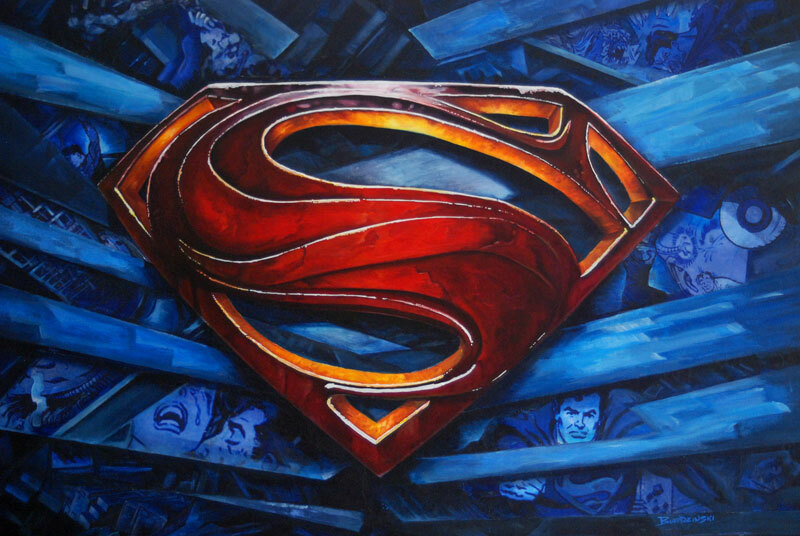 I did some research on the most notable Superman comic moments throughout the years, and found lots to work with. After seeing some wonderful art of Superman’s Fortress of Solitude, I thought it would be a good device to break up the images. I decided on a blue monochrome (one color) collage hidden behind the icy blocks protruding from the center. After some sketches, I realized that my collage idea resembled Superman’s chest! (One of those happy accidents in the creative arts!) So I made a few minor changes to the design to accommodate it. 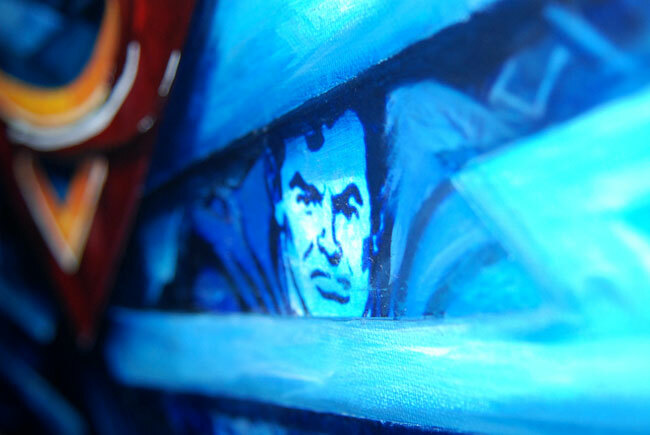 This way the painting will resemble one thing from far a way, (the “S on his chest) and still have highly detailed hidden images to keep viewers interested. I use vine charcoal for my preliminary sketches. It’s so light that the oil paint dissolves it immediately. Many thanks to my friend, TJ Jaskolka at Embrace Salon, for giving me the opportunity to paint such an iconic image. Have any ideas for an original painting of your own? Does your home or office need something but you just can’t find it in the stores? Contact me and let me help you solve this problem. My paintings make great gift ideas too!